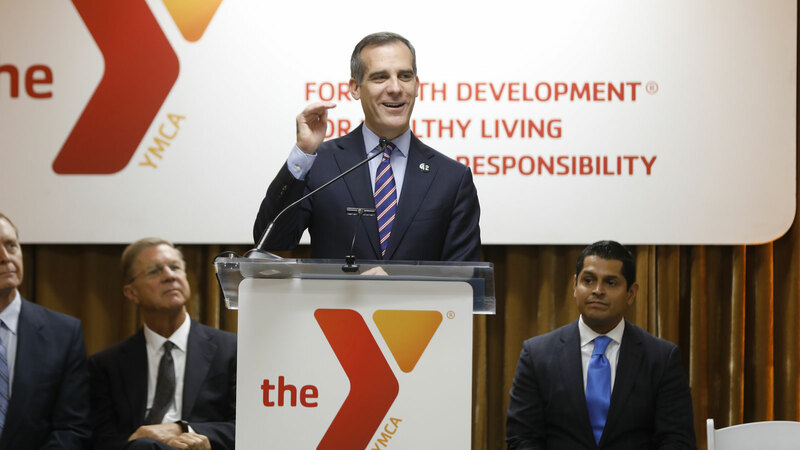 Mayor Garcetti joins Cal State LA, YMCA to launch Achieve LA. 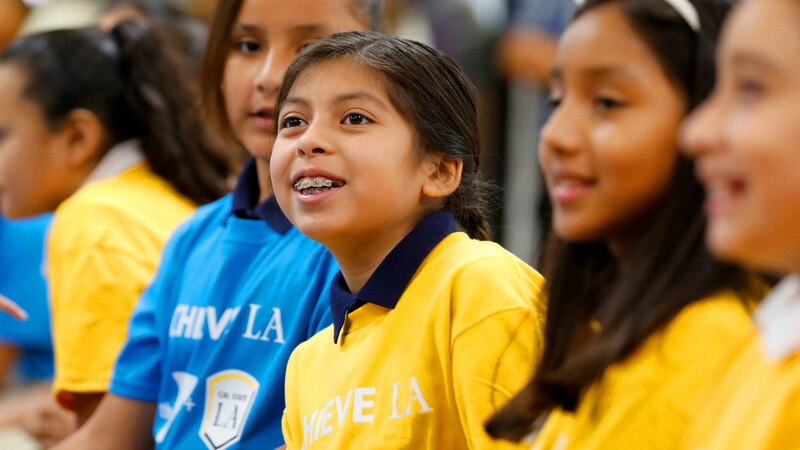 Dozens of bright-eyed students decked out in gold and blue T-shirts listened intently inside the Weingart East Los Angeles YMCA as leaders promised hope and opportunity for their futures. “We believe that a child growing up in Boyle Heights or South L.A. should have the same access to programs and support as kids in Brentwood or Encino. There’s no limit—if you believe, you can achieve,” Mayor Eric Garcetti said at the event announcing Achieve LA. Achieve LA is a new partnership between California State University, Los Angeles and the YMCA of Metropolitan Los Angeles. The initiative will leverage existing Cradle to Career Success Initiative programs at four YMCA locations to inform youth about the college admissions process and prepare them to enroll at a university. Youth who participate in the initiative and meet University requirements will be guaranteed admission to Cal State LA. The initiative is the first of its kind at any YMCA, according to officials with the Y. The mayor was joined at the launch by Assemblymember Miguel Santiago, whose 53rd District includes areas that will be served by the initiative; Cal State LA Executive Vice President Jose A. Gomez; and YMCA of Metropolitan Los Angeles President and CEO Alan C. Hostrup. Achieve LA will be offered at the Weingart East Los Angeles YMCA location, as well as the Crenshaw Family YMCA, Southeast-Rio Vista YMCA and the Weingart YMCA Wellness and Aquatic Center in South Los Angeles. Under the initiative, Cal State LA students will mentor and advise youth in the YMCA programs. These students, some of whom attended the news conference, are part of the University’s I Serve LA initiative, which provides thousands of volunteers who serve with community-based organizations across Los Angeles. “Cal State Los Angeles is not just a great university in the greatest city on the face of the earth, they’re number one—they’re number one for social mobility and economic mobility in the United States of America,” Garcetti said. Hostrup said the YMCA was honored to launch the partnership with Cal State LA. “The program will offer teens in our city’s most under-resourced communities, the tools, the support and guidance needed to reach their potential by providing a clear pathway to college,” Hostrup said. 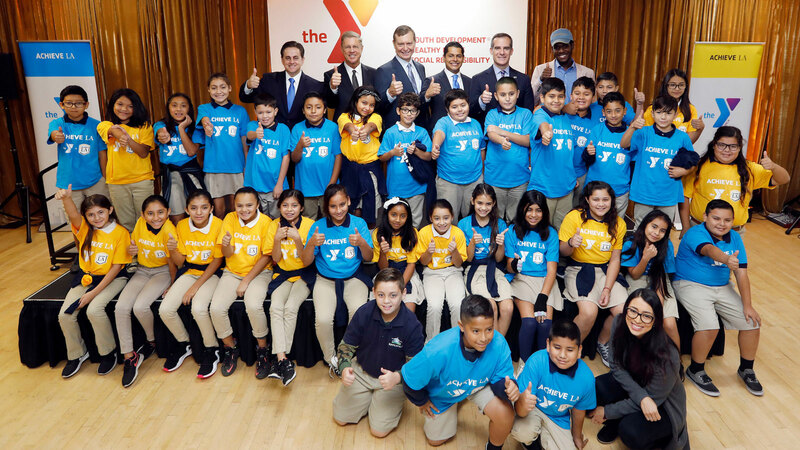 Santiago praised the new initiative and thanked the YMCA and Cal State LA for their commitment to serving youth in Los Angeles. “We know, out of this program, we will ensure that every student that goes through these doors will get a college diploma. Right, kids?” Santiago said to the fifth graders gathered at the event from KIPP LA Prep, a public charter school next door to the Weingart East Los Angeles YMCA. As a child growing up in Compton, Jaren Savage participated in programs at the Weingart YMCA Wellness and Aquatic Center. Savage, who recently graduated from high school, plans to study car design in Torino, Italy. 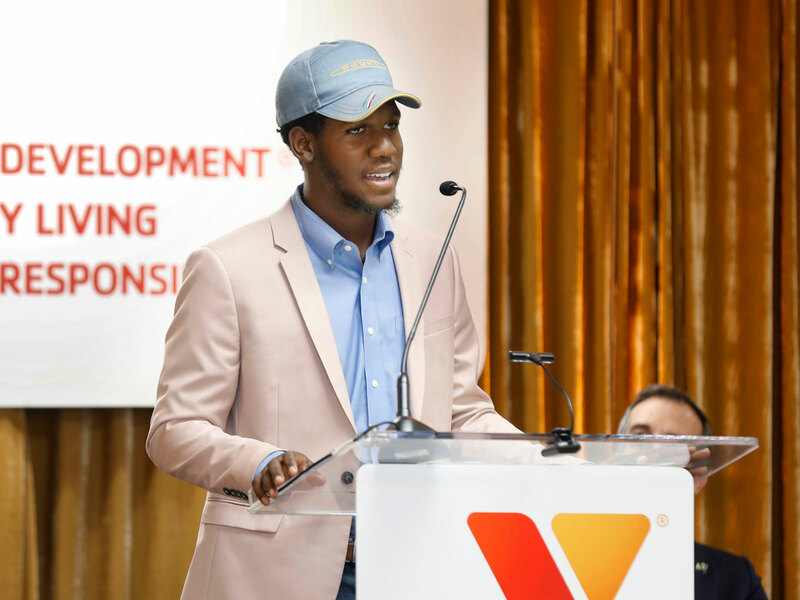 “Thanks to this historic partnership between the YMCA of Metropolitan Los Angeles and Cal State LA, thousands of youth just like me will have the chance to attend Cal State LA and become Golden Eagles,” said Savage, whose mother is an alumna of Cal State LA. Achieve LA aligns with the mayor’s Los Angeles College Promise and College Corners initiatives, which are creating pathways to higher education and fostering a greater understanding of the college admissions process for all Angeleno families. 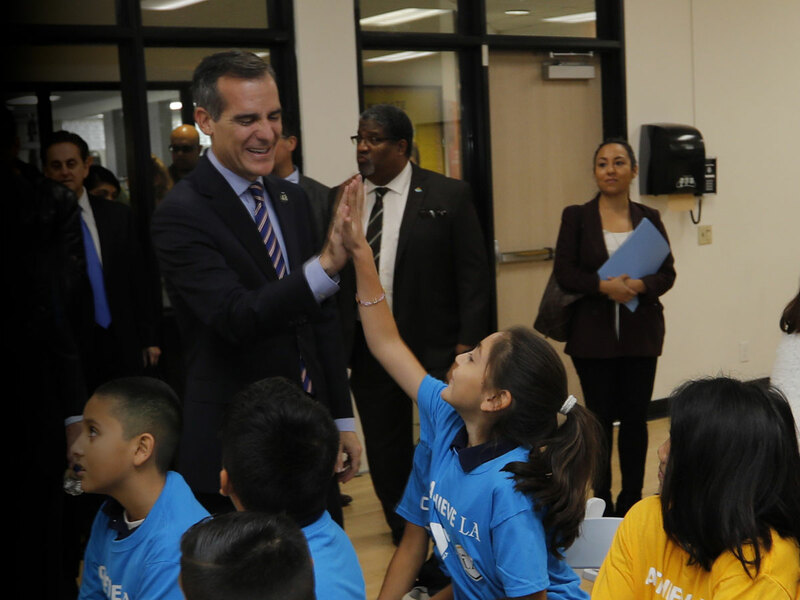 Garcetti applauded the new Achieve LA partnership and Cal State LA’s success in transforming students’ lives.